10/8/2007Share this story on Facebook! Belay: Protecting a climber from falling by using a rope. Ablation zone: The area of a glacier where yearly melting meets or exceeds the annual snowfall. Lead climbing: A form of climbing in which the climber places anchors and attaches the belay rope as they climb. Jamming: Wedging a body part into a crack. Flake: A thin slab of rock detached from the main face. 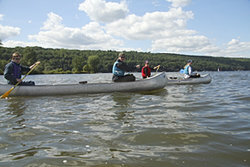 The Department of Recreation and Leisure Studies is organizing a backpacking outing to the Finger Lakes National Forest. 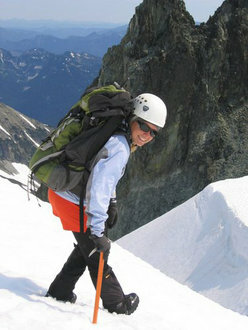 Students will learn trip preparation, menu planning, cooking techniques, and safety considerations in both moderate- and cold-weather camping. You can also learn fundamentals in backcountry travel, including day hiking, backpacking, flat-water canoeing, cross-country skiing, and snowshoeing. The outdoor adventure learning community will also be backpacking in the Finger Lakes National Forest in October and will host a destination ski trip to Killington Resort in Vermont in December. No gear is no problem thanks to IC’s Outdoor Recreation Equipment Center. Rent what you need for your own outing, or sign up for one of theirs! The poster was for a 13-day glacier mountaineering course offered by the Department of Recreation and Leisure Studies in collaboration with Alpine Ascents International, a mountaineering school in Seattle. The two-credit course is open to students of all majors and grade levels, and previous mountaineering experience is unnecessary. Olson and two other students took advantage of the opportunity to spend nearly two weeks in Washington, where they learned snow-climbing techniques, ways to save themselves and other climbers from falling, and rescue drills. They spent the first five days of the trip ascending and descending El Dorado Peak, an 8,868-foot mountain. It took the climbers 10 hours to climb to the low camp on El Dorado, which stands at approximately 4,000 feet. There, they learned how to walk up and down steep slopes in the snow and how to glissade (a controlled slide down a slope). On the third day, the students climbed to the high camp at approximately 7,500 feet, where they learned how to build snow anchors. They also slept in tents on the mountain and cooked their own dinners on the snow. Margaret Arnold, associate professor of recreation and leisure studies, believes that the opportunity to earn college credit while participating in an outdoor adventure is valuable for students of all majors. Are you climbing the walls thinking of a career path? Then check out Ithaca's Department of Recreation and Leisure Studies for information on career paths and possibilities.